Our tried and true Flyboarding package! Perfect for your first flight! No experience necessary and we provide all safety instruction, pre-flight training, and equipment. In minutes you will be soaring out of the water under the instruction of our skilled and qualified instructors. Our tried and true Hoverboard package! Perfect for your first flight! No experience necessary and we provide all safety instruction, pre-flight training, and equipment. In minutes you will be soaring out of the water under the instruction of our skilled and qualified instructors. Our tried and true JetPack package! Perfect for your first flight! No experience necessary and we provide all safety instruction, pre-flight training, and equipment. In minutes you will be soaring out of the water under the instruction of our skilled and qualified instructors. 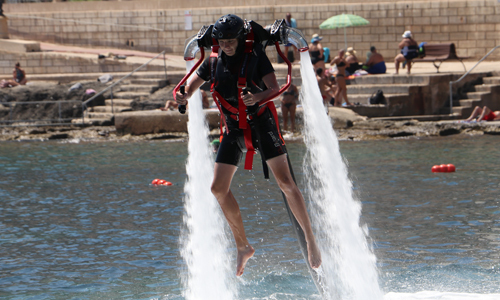 Don't be deceived in thinking that the Jetpack is easier than the Flyboard. Its not!! 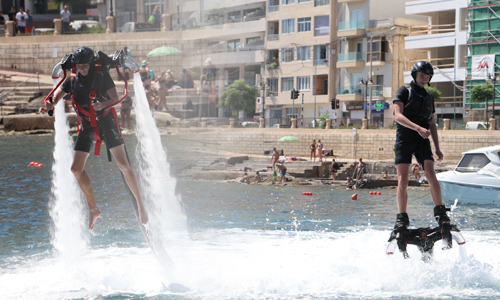 If you have'nt tried the Flyboard before, we suggest you try the Flyboard first. Want to explore two hydrofly equipment! Perfect for your first flight! No experience necessary and we provide all safety instruction, pre-flight training, and equipment. 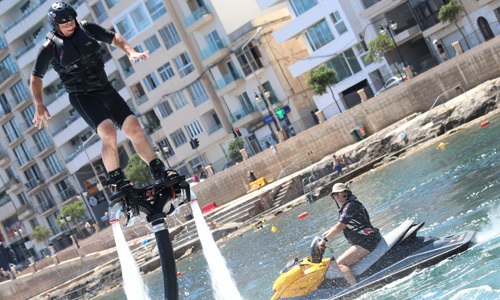 With FLyboard you will be soaring out of the water in a few minutes whilst JetPack requires a little bit of persuasiveness but always under the instruction of our skilled and qualified instructors. Deposits on bookings are only refunded if sessions are cancelled due to bad weather and cannot be held in Rinella, Kalkara. Bookings cannot be postponed and deposits are not refunded. A qualified Fly Board Instructor who will stay with you for the whole duration of your flight, the instructor will operate the Fly Board via the Jet Ski throttle and will keep you safe at all times. Contact us on +356 9947 1644 or +356 9940 3147 to book your flight. We guarantee that our experience would be talked about for months to come. We offer individual special discounts on return customers. A GoPro attached to your helmet is also available at €20 (New 8GB Micro SD Card included) to record the entire experience. The 8GB Micro SD Card will be given to you after the session and it will be yours to keep. Photos and a 2-min video are taken from the Jet-Ski and transfered to you via we-transfer, all we ask in return is to write a review on Tripadvisor. If you find no objection, the best 4 photos are posted on our Facebook Page, tagged and your Review of Tripadvisor included in the description of the album. The photos are only taken for single flights up to a group of 12. When working with TWO FLYBOARDS, photos and videos are not available. OUR BASE LOCATION is SPINOLA BAY unless otherwise advised by phone, sms or email. If you are in doubt please contact us before coming on location.